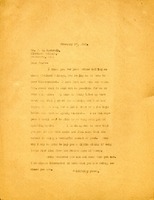 The Berry Schools acknowledges Mrs. Jones' letter from July 16th. 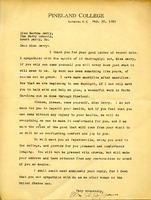 As Miss Berry is away from the office at this time, they will hold her letter until Miss Berry returns and bring it to her attention then. 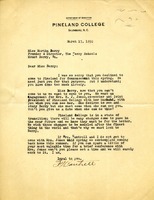 Martha Berry will not be able to give the commencement address at Pineland College. 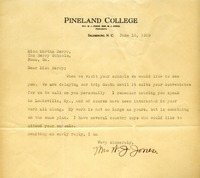 Mrs. James implores Berry to come herself to give an address at Pineland College. 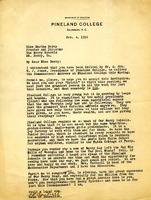 Martha Berry writes to Mr. & Mrs. Jones to inform them that she's unable to perform the Commencement address for Pineland College because she is not doing any public speaking due to illness. She hopes that they are able to find someone else in time. 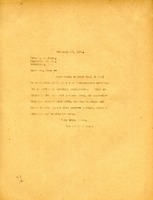 Letter requesting Miss. 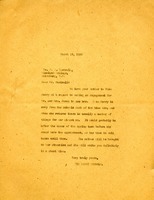 Berry to deliver the commencement speech on May 16th. 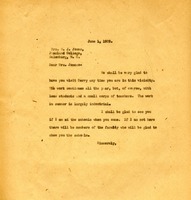 Mr. F.S. Cantrell, one of her boys, is the head of the Education Dept at Pineland. 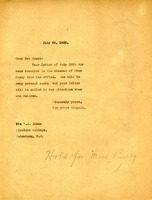 Mr. Cantrell expresses his sorrow that Miss Berry cannot attend commencement at Pineland College and asks if Mrs. W. J. Jones can visit Berry's campus since he is unable to make it. Miss Berry says she is unable to come to Commencement and that she will probably not be able to ever do as much public speaking. 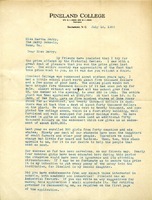 She thanks him for writing to her and tells him that she always enjoys hearing what he's doing and where he is. 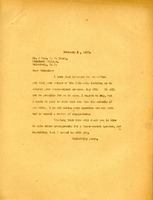 Martha Berry writes to Mrs. W.J. 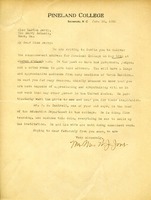 Jones to say she is welcome to visit Berry any time she is in the area. 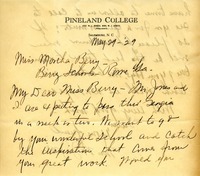 Mrs. and Mrs. Jones, presidents of Pineland College, wish to visit Berry on their trip through Georgia. A Berry graduate, Mr. Cantrell, will be teaching at Pineland.